The Measurements extension adds performance measurement features to tests developed with the MuseIDE. The 0.2 release adds several capabilities that are crucial to our goal of using Muse for load testing. This plugin adds the ability to collect performance measurements at a regular interval. To turn this on for a test, add the Periodic Measurement Collector test suite plugin to the project. The collection interval is configurable in milliseconds. The default is 10 seconds. When this plugin is added to the project and applied to a test, it will store all the measurements into a single file after each collection period. The files are named in sequence (ms0.json, ms1.json, … ms999.json) and the JSON format is easily readable by code and, to a lesser extent, by humans. Each file contains metadata and measurements sections. In this example, the metadata includes the sequence number of the sampled measurements, which happens to match the numerical part of the filenames (0, 1, … 999). Each measurement in the measurements section contains a value and metadata describing the measurement. Most measurements will have (at least) two relevant metadata: the subject, which identifies what “thing” was being observed and the metric, which identifies what property of the “thing” was measured. Looking at the second measurement in the example below, we can see that the avg-dur of all-steps was 203 – in other words, the average duration of all steps completed during the measurement period was 203 (milliseconds). We can also see that the number of (measured) steps completed was 4. This format was designed for flexibility and to be self-describing – making it very easy to parse and understand a large set of measurements with code. It allows for more metrics and subjects to be added dynamically while a test runs (or be removed, to optimize resource usage). You could even change the sampling period during a test. The open metadata allows tagging of measurements with additional information – in the case of load generation from multiple geographical regions, a region=us-east attribute would identify measurements from a specific load-generating location. When this plugin is active, it will collect measurements and store them in CSV files by subject. There will be one file for each subject, one column in each file for each type of measurement collected for that subject (i.e. each metric) as well as a sequence column (0, 1, … 999). 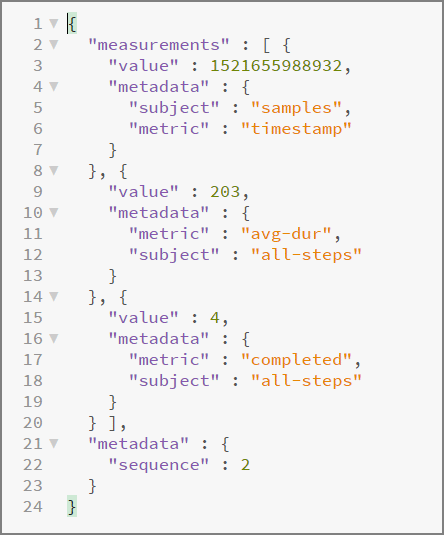 From the previous JSON format, we could see that there were two metrics collected about the all-steps subject, the completed and avg-dur metrics. 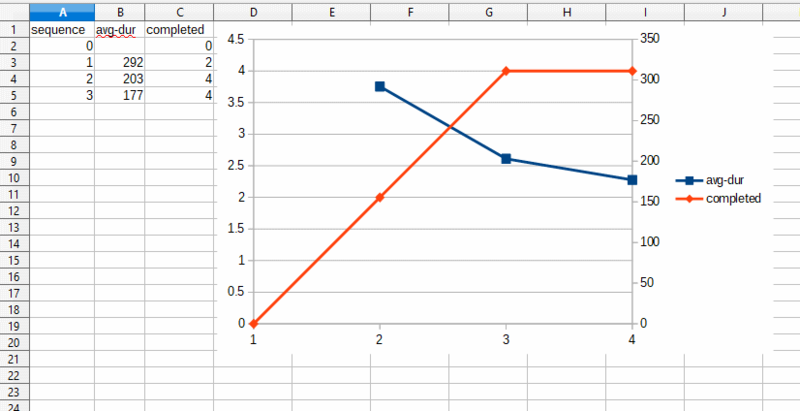 Opening the all-steps.csv file in a spreadsheet allows you to easily see those two metrics in columns and observe how those values change over time (the rows). For immediately-useful visualization, you can add a chart with just a few clicks. 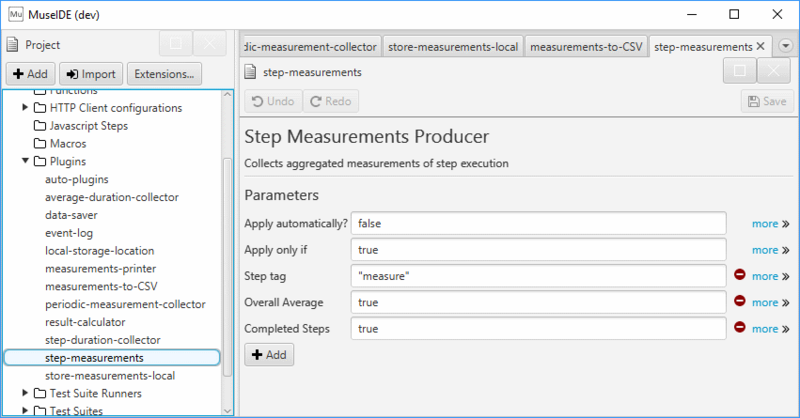 Similar to the Step Duration Collector, you can collect measurements on ALL steps (the default), or tagged steps using the Step tag parameter (I think you’ll find the second option much more useful). The producer currently supports average duration and completion count metrics in aggregate (for all steps). Look for more types of step measurements in the next release! The extension can be added to your Muse projects via the Extensions button in the project navigator. This extension is open source – feel free to examine the source code on my GitHub.